Trevor Bird was diagnosed with ALL when he was 3 years old but has been cancer-free for several years. Trevor Bird wasn’t feeling it. Eight-year-old Kylee Hook, in her super bold red jacket and cancer-fighter superhero gold cape, gingerly scooted her walker his way. He stood up, turned around and gave her a hug, with a big, ol’ beaming smile on his face. Just like that, Trevor, dressed in his Minions hoodie, was back in the game. By the time the Cancer Survivors Walk rolled around – it was the culminating event of the childhood cancer awareness 10K and 5K known as Run to Fight — Trevor was bright as sunshine, popping the rubber bracelet on the wrist of his dad, Dave, laughing with glee as his dad yelped, “Owww!” every time he did it. Trevor was just 3 years old when he was diagnosed with acute lymphocytic leukemia. 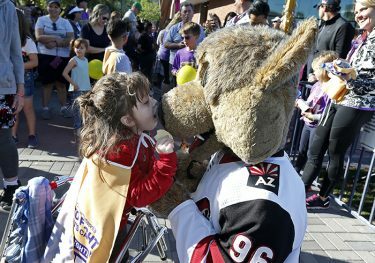 Kylee Hook, 8, gives Arizona Coyotes mascot Howler a kiss. It wasn’t the only challenge Trevor has had to overcome. He also was born with Down Syndrome. Trevor’s treatment ended years ago. “He is doing great now,” Dawn said of 14-year-old Trevor. He was doing great, too, at Saturday’s Run to Fight partly because of Kylee Hook. “Her favorite thing to give is hugs. … She’s very affectionate,” said Hook’s mom, Carlene Palmer, who said her daughter hit all her developmental milestones when she was a baby and toddler. Runners begin their sprint from the start line in the Run to Fight Children’s Cancer 5K. Then the unthinkable. She was diagnosed with an astrocytoma — a cancer of the brain. Doctors told the family the tumor is inoperable. It’s a quality she shares with many of the children at Run to Fight Children’s Cancer, which supports Children’s Cancer Network and Phoenix Children’s Hospital. Not only did participants have the choice of running in the 10K or 5K (which they also could walk). They could churn out arts and crafts alongside Miss Scottsdale in the Cancer Survivors VIP Area, commune with Disney princesses, watch magic by Ryan Fox (“The Amazing Blind Magician”), break out some hula-hooping as a warmup before the race, visit with mascots such as the Arizona Coyotes’ Howler, gab with a couple of Arizona Cardinals cheerleaders, or peruse the vendors in the festival area. The GCU Cheer and Dance teams were there, too. Run to Fight, the signature event of CCN, is in its ninth year of supporting families affected by pediatric cancer. 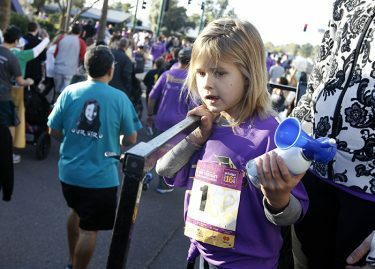 It is the largest race in Arizona dedicated to bringing awareness to the group of childhood diseases. According to the National Pediatric Cancer Foundation, only about 4 percent of federal government cancer research funding is allocated to study children’s cancer. Yet statistics from the American Cancer Society revealed that almost 10,600 children younger than 15 years old were expected to be diagnosed with cancer in 2018. CCN has been supporting and advocating for pediatric cancer survivors and their families since the organization was founded in 2004. It serves more than 750 families annually through its family-centered programs, gives more than $75,000 of gas and food cards to families annually, and awards at least $30,000 in scholarships each year. Since CCN launched Run to Fight in 2011, it has raised more than $600,000 for the campaign against pediatric cancer. Adrianna Gavazzo decided she wanted to celebrate her eighth birthday at Run to Fight. Angela West, standing in front of a table of cupcakes and gold gift bags, found her way to Run to Fight this year through her daughter, Adrianna Gavazzo, who was 6 years old when she was diagnosed with Ewing sarcoma. She fought cancer for two years. On Saturday, she was celebrating her eighth birthday and told her mom she wanted to have her party, not at the typical pizza and video games place or at a theme park, but at Run to Fight. 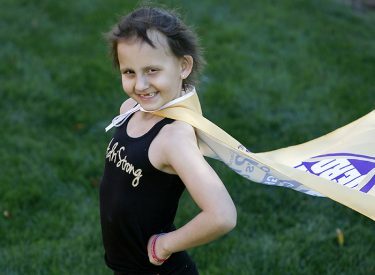 “There’s no evidence of the disease,” said West, who wore a black T-shirt with sparkly gold lettering that said “Adri Strong.” She looked toward her daughter, also decked out in her Adri Strong T-shirt, an orange bow and St. Patrick’s Day green beads. West said her family was determined to come out to Run to Fight to support CCN – “because of all that they did for us,” she said. About 50 family and friends came out to support Gavazzo, including Ashley Whipple, a nurse at Phoenix Children’s Hospital. 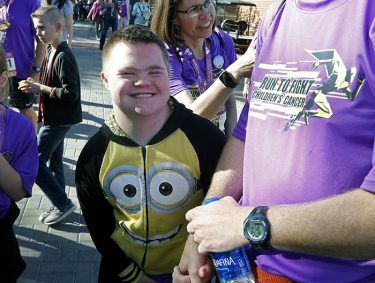 “You came!” West said with a smile as Whipple arrived a few minutes before the start of the 5K. Gavazzo welcomed her with a big hug. “We bonded,” Wipple said of her time with Gavazzo during her treatments. 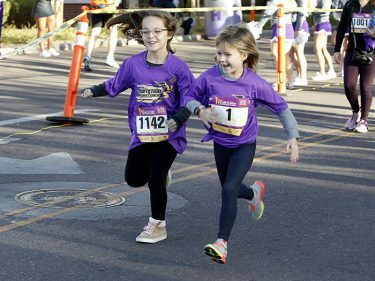 When the 5K launched at 7:45 a.m., one VIP on hand to make sure things got off to a good start was 7-year-old Gwyn Satterlee, who sounded the air horn to start all three walks and races that day – the 10K, 5K and the Cancer Survivors Walk. Satterlee was 4 when she was diagnosed with leukemia. She is in remission. Gwyn, her mom Leslie, dad Galen and sister Paige were front and center for interviews by various media throughout the event. … and then had just as much fun running. Phoenix’s Ed Dean, whose son is working on his master’s degree at GCU, launched himself into the 5K wearing his “Where’s Waldo” red-and-white-striped T-shirt. 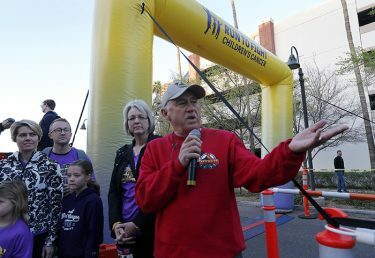 He has run at various events in support of animals and other causes, but for him, “This is more meaningful,” he said, as he gathered with so many families battling childhood cancer. Grant Gary and his family, all avid Lopes fans, returned to campus to join in the race for the fifth time. His son, Evan, died of leukemia seven years ago. Evan wanted to become an engineer. Grant said he even wrote the Lego company to ask how he could become a Lego engineer (and received a letter back). Grant and his wife, Carol, a GCU alumna, set up a scholarship in his name at GCU for a student who wants to become an engineer or go into the medical field. Butch Glispie, owner of presenting sponsor Pono Construction, addresses the crowd before the races. That’s Carol Gary directly behind him. Host sponsor GCU has supported CCN and Run to Fight since its outset, and so has the event’s presenting sponsor, Pono Construction. Stacia Wermager, a senior at GCU on target to graduate in April with her Bachelor of Science in Biology with an Emphasis in Pre-Physician Assistant, worked as a volunteer at the event through Phoenix Children’s Hospital. But Wermager’s connection to the walk is more than just through GCU. She also is a childhood cancer survivor who fought fibrosarcoma. It is because of her time in hospitals and around health care professionals that she wanted to go into the health care field. “I love seeing all the survivors,” she said. Arizona Cardinals Cheerleaders Nikki Sandusky and Amanda Johnson returned to their alma mater – GCU – to show their support. 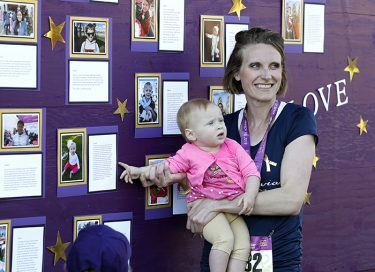 The stories of cancer-fighting kids were displayed on the board in front of GCU Arena. Both were on the Dance Team at GCU, so they were familiar with Run to Fight. “We wanted to come back,” said Johnson. Patti Luttrell, CCN’s executive director and a former nursing faculty member at GCU, said she’s inspired every year by the cancer survivors and their families and friends who come out and show just how strong they can be. She met Wermager at the race and was happy to see how she has grown up and is about to start her professional life – as it should be for every child. Click here to see more race results.